Patience has been my repeat New Year’s resolution for the last two decades. Grocery store lines prickle my skin. Red lights make me antsy. Peeking at Christmas presents? Guilty! In general, I detest waiting, unless it’s worth it. Really worth it. Perfectly CARAMELIZED ONIONS are worth it. Caramelizing onions transforms them from pale, pungent slices into sweet, rich ribbons of velvet. It is a process that takes at least a half hour, more if you truly take advantage of the onions’ potential. The flavor, versatility, and depth you receive in return for perfectly CARAMELIZED ONIONS, however, is worth every fragrant minute. Who would have guessed that these lovely rounds could be transformed to caramel? Because the cook time is largely unattended, caramelizing onions is a task you can literally shift to the back burner. Another time-saving option is to prepare them in advance, then store in the fridge until ready for use. Pungent slices, about to be caramelized into sweet ribbons. Whatever your end, these perfectly CARAMELIZED ONIONS are worth the wait. Perfectly Caramelized Onions. Flavorful, versatile, and simple to prepare. 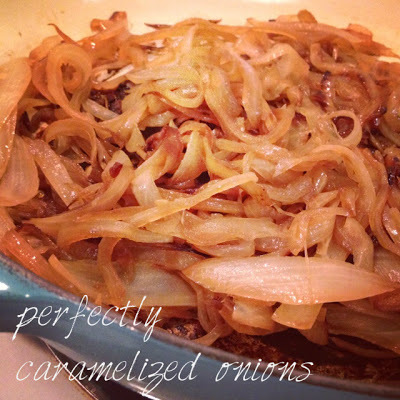 Step by step to make perfectly caramelized onions. Thinly slice onions. Place in a large skillet over medium heat. Cover and let cook, stirring occasionally (about once every five minutes), until the onions are dry but not yet sticking to the pan, about 15-20 minutes. Stir in olive oil and salt, then cover and reduce heat to low. Continue to cook, stirring infrequently, until the onions turn a deep caramel brown, at least 15 minutes and up to 40 minutes more. Use as desired. not only do we have the same tastebuds and food preferences, we have the SAME PAN! Rachel, we are clearly kitchen soulmates. When are you next in Madison? I want to cook you dinner! I’m pretty obsessed with caramelized onions too! Thanks for sharing. And what a fabulous obsession to have. Thanks for the comment! Hope you enjoy. Let me know if find any new, tasty uses. I’m practically making them in bulk! Yum! We love caramelized onions on pizzas, hot dogs, burgers, and more. Thanks for the post! Aren’t they just the best?? I feel like I’m creating magic every time I make them. You’re absolutely right, caramelized onions are totally worth a load of patience. My favorite way to use them is on perfectly-grilled burgers stuffed with blue cheese on buns spread with homemade mayo. Delicious! By the way, I found your blog through Not Without Salt. What a fun discovery! Welcome! Thanks for saying hi and for your comment. So happy to have you here! Oh my goodness, you have just described a wonderful burger that would put me into a happy food coma. While I’ve had stuffed burgers in the past (the “juicy lucy” is a source of city pride in Minneapolis, where I spent several years), I’ve never tried one with blue cheese. Sounds amazing and caramelized onions would be a perfect pairing.